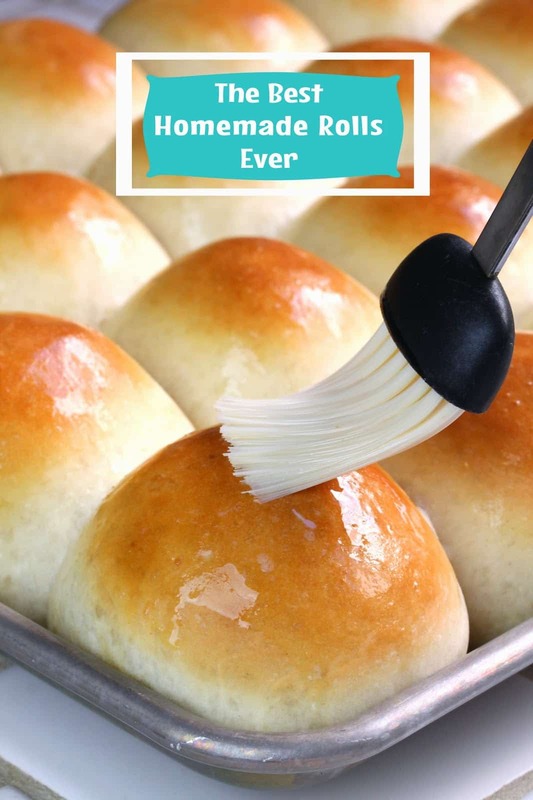 The Best Homemade Dinner Rolls Ever! These dinner rolls are soft and practically melt in your mouth. They are truly the most amazing dinner rolls ever. Just read all the rave reviews! This recipe has been in development for over 5 years. Not joking. I have been attempting to master the dinner roll for over 5 years. I have made dozens upon dozens upon dozens of batches, slowly developing the perfect roll. I’ve had the recipe solid for about a year now and I am finally ready to share it. Can I use this recipe to make cinnamon rolls? Yes! I’ve made these into a fantastic cinnamon roll recipe too! Best cinnamon rolls ever! What if I don’t have a stand mixer? You can knead it by hand! Start out by stirring with a spoon until you can’t do it anymore and then knead it with your hands. Just keep on kneading until all the flour is incorporated and/or the dough is soft to the touch and only slightly sticky. It’s a bit of a workout, but it’s worth it! Can this recipe be made gluten free? Can I substitute gluten free flour? This recipe was not designed to be gluten free. Gluten free baking involves completely different chemistry. In general, you cannot substitute gluten free flour in baking recipes and expect it to work, however, several people have reported that a blend like Cup for Cup will work. Can I use another kind of yeast besides instant dry yeast? Yes, all yeasts will work in this recipe, it’s simply a matter of understanding how each kind of yeast works and differs. Instant dry yeast can be added straight to dry ingredients and doesn’t require any sitting or proofing. It also rises a bit quicker. Active dry yeast is a bigger size of granule and generally needs to be dissolved in a liquid before adding to a recipe. It activates a bit slower so expect 10-15 minutes extra in rise time. You can freeze these after you shape them into rolls. When ready to eat, remove them from the freezer and allow to thaw and rise until double in size before baking. This can take anywhere between 1 to 2 hours, depending on the temperature in your home. Can I make these ahead and put them in the fridge? Yes! You can make your dough, shape them into rolls, cover them and place them into the fridge up to 24 hours before you bake. When ready to bake, remove from the fridge and let sit 30 minutes before baking. How should I measure the flour? The flour you buy at the store these days is generally pre-sifted. There is no need to sift your flour. I prefer the scoop and sweep method as it is ultra-convenient. Simply use your measuring cup to scoop out the flour and level off the top. Weighing your flour using a kitchen scale is the only way to ensure complete accuracy. Even then, bread making is a both fickle and forgiving and the actual amount of flour you add can change just due to the humidity in the air. When making this roll recipe, it is best to go by the touch and feel of the dough. 1 cup of flour is approximately 125 grams. What should the dough feel like? The dough should be slightly sticky, but still very soft and pliable. It should just barely not be sticking to the bowl. If you add too much flour and the dough stiffens, your rolls will also get a little stiff. I like to say you can feel a soft roll just by touching the dough. 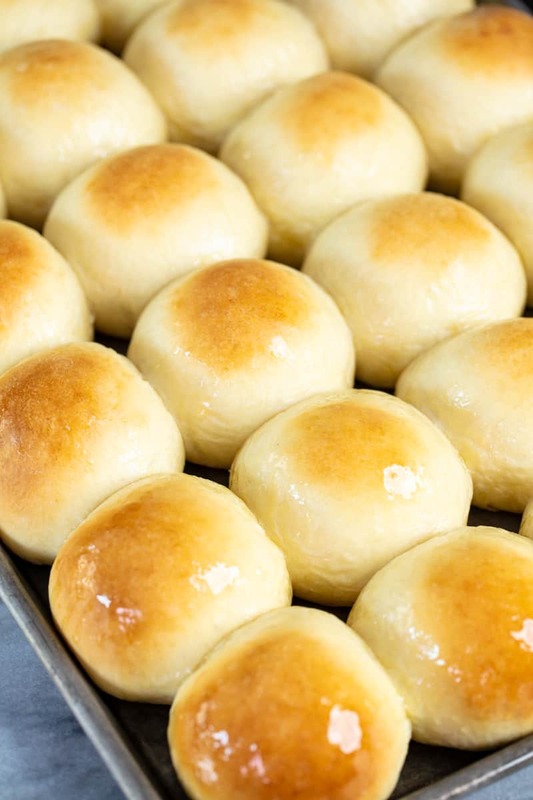 Perfectly soft dinner rolls that melt in your mouth! These are truly the most amazing dinner rolls ever. Just read all the rave reviews! In the bowl of a stand mixer, combine warm milk, yeast, sugar, salt, butter, and eggs. Add in 5 1/2 cups of flour. Using a dough hook, turn the mixer on to a low speed. Once the flour starts to incorporate into the dough, increase the speed to a medium range. Slowly add the remaining 1/2 cup of flour until the dough pulls away from the sides of the bowl. The dough mixture should be slightly sticky and soft. Add more or less flour until the dough reaches the desired consistency. The amount of flour you add in bread making is always an approximation and you should go by feel. Transfer the dough to a lightly greased mixing bowl. Cover with a towel and let rise 90 minutes. Lightly grease a baking sheet. Punch down the dough and form into 24 rolls. Place on the greased baking sheet in six rows of four. Cover and let rise 1 hour. Preheat oven to 375 degrees. Bake the rolls for 12 to 14 minutes, until lightly browned. 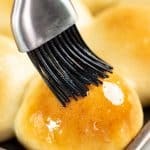 Remove rolls from oven and brush with melted butter. Serve the rolls warm, or to cool, let rest on the pan for 15 minutes before transferring to a wire cooling rack. Once cooled completely, store in a plastic bag. I am dairy free. Can I use oat milk or any of the plant based milk substitutes? If I use rapid rise yeast, should I or could I skip the second ride? Rapid rise yeast is Fleischmann’s brand name for instant yeast. Hey Rachel, What can I use to cover the dough rolls in step 5, which would not stick to the dough and thereby affect the rise. I used a wet cloth which stuck to the rolls after the rise. A dry dish towel will work just fine. A wet towel is not a good idea as it adds moisture to the dough which is why yours stuck. I have not made homemade rolls for over 30 years. These are really easy to make and are very good. Thank you. I tried this recipe second time today iwthoutthe egg and the rolls turned out amazing! Do you notice a difference in the rolls if you use skim, 2%, or whole milk? I’m wondering if fat content in the milk makes a significant difference in breads. I always use skim because that’s what I have in the house . When it comes to these rolls, I recommend just using what you have on hand for the % fat in the milk. I use 2%, but I’ve also used skim and whole and they are both delicious as well. When you weighed your rolls out, how many ounces did each roll wind up being? Weigh the entire batch of dough and divide by 24. Mine usually weigh between 2.4 and 2.5 ounces. I made these this morning and just took them out of the oven. They are excellent. They melt in your mouth! Thank you for this recipe. I’ve tried a couple lately and they left a lot to be desired. These were marvelous. I accidentally added only one egg and they were still fluffy delicious. Thank you for the recipe! These are heavenly! Thank you! Can this recipe be doubled? yes it can! Just be sure that your mixer can handle that much dough in one batch. Have you used honey instead of sugar?